The excitement of Christmas time is just around the corner. The smell of refreshing winter air, the snow falling down, the hot chocolate, and the spectacular Christmas lights hung from one corner to another. This year 2012, for the first time Disney California Adventure’s Buena Vista Street will be decked out for the holidays. There’s going to be vintage decorations with window displays that take on the form of the 1920’s and 1930’s. Carthay Circle Theater along the outside will have an old fashioned 50 ft. Christmas tree with all the bells and whistles, even underneath the tree will be adorned with retro toys and a working model train. Elias & Co. department store will have their own Santa to take pictures with the kids.. and adults. There’s even a tree-lighting ceremony with the Buena Vista Street Community Bell Ringers, and performances by the Citizens of Buena Vista Street. Cars Land will also be decorated with festive lights, and some cute snow character cars will also be driving around for some photo ops. 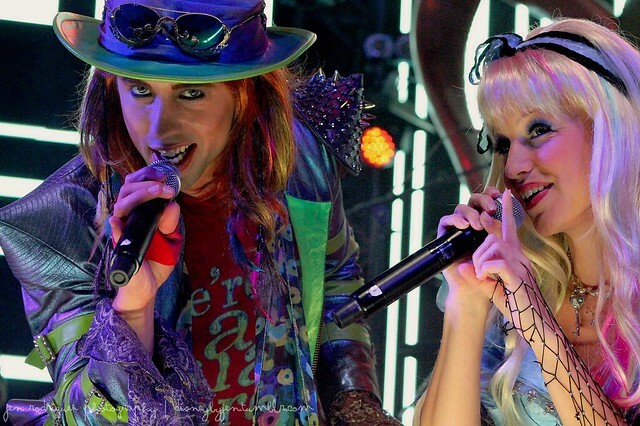 Kick off some fun at night with a wintertime “Mad T Party” with Alice and the Mad Hatter adding some holiday cheer in Hollywood Land. You can’t miss the “World of Color” holiday overlay over at Paradise Pier where elves from “Prep & Landing” might drop in. The pier’s boardwalk will be adorned with Christmas decorations and a holiday street show, “Phineas and Ferb’s Rockin’ Rollin’ Dance Party” will entertain you with a holiday outfits and tunes. Feel like seeing what bugs see? Check out the Bug’s Land and see the decorations there, it’ll really put things in perspective… as a bug that is. Disneyland celebrates the holiday season from November 12, 2012 to January 6, 2013. Unlike Walt Disney World, where they have a Mickey’s Very Merry Christmas Party with lots of hot cocoa. Disneyland offers the holiday overlay with admission. The enjoyment of the Holiday overlay decorations in the parks where Sleeping Beauty’s castle is turned into a winter castle. A Christmas Fantasy parade with Santa Clause joining with Mickey and his friends. 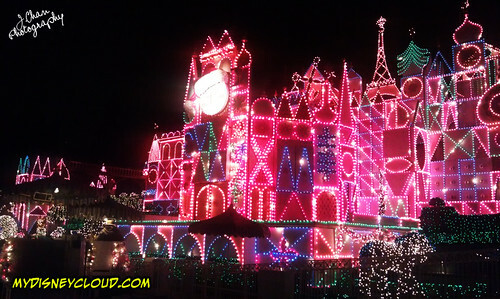 In Fantasyland, “It’s a Small World” ride attraction has their holiday overlay too. Check out New Orleans Square and you’ll notice the “Haunted Mansion” has transformed and Jack Skellington and his pet, Zero, have taken over Christmas. Go to Big Thunder Ranch and there’s Jingle Jangle Jamboree which is a meet-n-greet area with Santa and Mrs. Claus, classic Disney characters dressed in the holiday spirit. There’s also tasty treats and specialty drinks that Mrs. Claus has cooked up, games, and craft-making too. End the night with “Believe… In Holiday Magic” Fireworks Spectacular”, an absolute must see. Sleeping Beauty’s Winter Castle is lit up with over 80,000 twinkling lights and lit up icicles along the castle, the fireworks add that extra specialness that just leaves you breathless. I almost forgot: at Downtown Disney there is also Disney’s “Secret of the Wings” Ice Skating Rink available! $12 toddler admission with skate rental (size 8T–13T double-bladed skates available)It is surrounded by a charming holiday village with festive assortment of seasonal eats and treats. “Snow”-covered pine trees, holiday lights and garlands. There’s also an interactive children’s art experience too! This entry was posted in Disney California Adventure, Disneyland and tagged adventure, california, christmas, dca, disney, disney california adventyre, disneyland, dl, holiday, parks, season, theme by JNYFAV. Bookmark the permalink. to meals. 1 efficient way to remedy yeastinfection naturally is to switch to a wholesome diet plan and make somechanges in your life-style. consulting, there is no way you can fail. by cellulite, thus, creating him skilled to do the job of writing about the information of cellulite such as its remedy. tips to get girl working with straightforward sms messages. particular lady, this system will show you the skills you will need to make it happen. article on a blog or if I have something to contribute to the discussion. It’s caused by the passion communicated in the post I looked at. It’s not my first time to go to see this website, i am browsing this site dailly and get nice data from here daily.